San Carlos Estates of Bonita Springs, Florida is located just south of the gated community The Brooks. 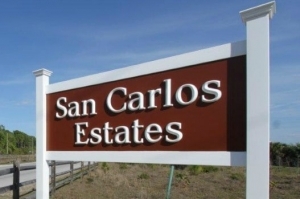 Lots located in San Carlos Estates are oversized. Many are 1.25 acres in size. There are both single family homes and buildable, vacant lots available in various locations of San Carlos Estates. Vacant lots purchased for the purpose of building a custom home should undergo and environmental audit. This will assure the lot is buildable. Also it will assure tortoise, scrub jay and indigo lizard are not located on the property. These critters are protected and can complicate development of real estate if on ssite. San Carlos Estates is located within bike riding distance to Coconut Point Mall. Florida Gulf Coast University is about 20 minutes drive to the north. There are ample sidewalks along US 41 – Tamiami Trail that will provide residents of San Carlos Estates access to the entire area by non-motorized travel.